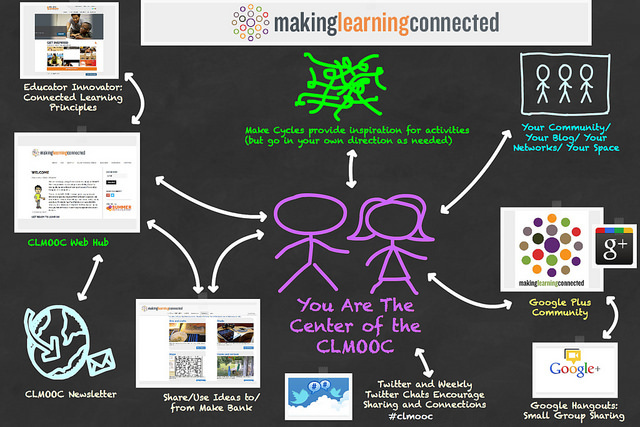 The first days of the Making Learning Connected MOOC have already brought a stream of cool sharing and connections. As a facilitator, I try to keep an eye on posts, making sure everyone is being greeted into whatever space they share, and just keeping a pulse on things that might emerge (avatar creators, for example). Yet, even for me, the open nature of our kind of Massive Open Online Collaboration can present the problem of “Where is the center of this whole thing?” Well, the easy answer is, there is no real center, although the main website and newsletters are anchors. The better answer is, the center of the CLMOOC is YOU, the participant. Even if you are only lurking and observing, which we value, YOU are where things are happening, and no matter where YOU are, it’s the right place to be at the right time. It sounds sort of flip to say it that way, but we believe that to be true, and making YOU the center is the ethos of the entire development of the Make Cycles (which begin tomorrow, Monday) and the way the CLMOOC endeavor operates. The graphic above a revamp of one I created last year, to try to visualize what that means. In our planning sessions, we talked about the emerging concepts of “A Domain of One’s Own” (a riff off Virginia Woolf) in which folks in digital spaces would ideally have their own spaces, which then connect in to something larger. You carve out identities, and then reach out to other communities and networks, expanding knowledge and connections as you see fit and as it makes sense for you. Wherever you are, it’s the right place.